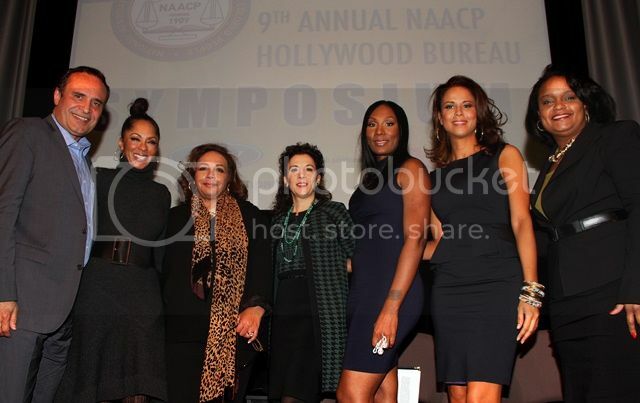 LOS ANGELES, CA — With the growing influence of women in the 21st century in the areas of media and entertainment, Ford Motor Company Fund returned as the lead sponsor of the 44th Annual NAACP Image Awards by sponsoring the 9th Annual NAACP Hollywood Bureau Symposium. This year’s symposium entitled, “Images of Women In Media: A Look Behind the Curtain,” was held Tuesday, January 29 at the Museum of Tolerance. Over 400 guests were in attendance. The 21st century has been dubbed as the “century of the women,” with roles and characters from Julia to Scandal’s Olivia Pope; indeed women have made an impact within the areas of media and entertainment. “Images of Women In Media” brought together a distinguished panel of industry executives and Hollywood’s most influential women to examine and discuss how the media has represented or misrepresented women in the past and the impact women will have on the future of the entertainment industry. “Ford is proud to partner again with the NAACP Hollywood Bureau Symposium to showcase women's contributions in the media and film industries,” said Pamela Alexander, Director of Community Development, Ford Motor Company Fund. “The symposium has become a vital part of the Image Awards whereby everyday individuals are able to rub shoulders with key industry executives that provide them real life tools and solutions that they can activate to help their dreams become realities.” A portion of Ford’s sponsorship goes to support programs within the community. The panel discussion looked behind the scenes and discussed how the roles and characters of women have evolved over the years. The panel discussion also shed light on the much-debated topic about the power media has on how we are viewed as individuals and how we perceive ourselves. Panel participants included Sil Lai Abrams, Founder, Truth in Reality; Neema Barnette, Filmmaker/Director; Towanda Braxton, Actress, Braxton Family Values; Madeline Di Nonno, Executive Director, Geena Davis Institute on Gender in Media, and Debra Martin Chase, Executive Producer of Sparkle. Vic Angelo Bulluck, Executive Director of the NAACP Hollywood Bureau, again served as moderator of the panel discussion. The Hollywood Bureau Symposium is one of several popular events during Image Awards Week that leads up to the live telecast of the 44th Annual NAACP Image Awards on Friday, February 1st at 8 p.m. EST on NBC.